KATHMANDU, July 22: Protestors and police officials were injured when cadres of Nepal Tarun Dal, a youth wing of the Nepali Congress, clashed with police at New Baneshwar area, Saturday. 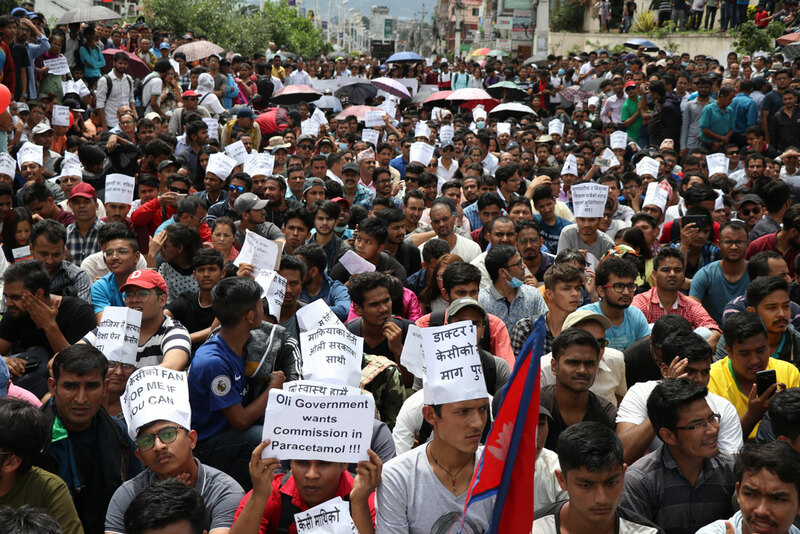 Dozens of the youth wing members had reached New Baneshwar to stage a rally expressing solidarity with the demands put forth by medical education reform crusader Dr Govinda KC, who has been on a hunger strike for the last 22 days. The protests at New Baneshwar turned violent after members of the NC's youth wing clashed with police while trying to enter a no-protest zone through the barricades set up by police. Dozens of protestors and 11 police officials were injured. Police fired 23 tear gas shells and hit protestors with batons while the protestors hurled stones at the police. Vehicular movements along the major thoroughfare of the capital came to a stand-still for almost an hour. According to SSP Bishwa Raj Pokhrel of the Metropolitan Police Range, Kathmandu, a total of 11 police officials including two DSPs and one inspector were injured during the clash and four protestors were hospitalized. “After the protestors advanced toward the no-protest zone, a clash ensued. 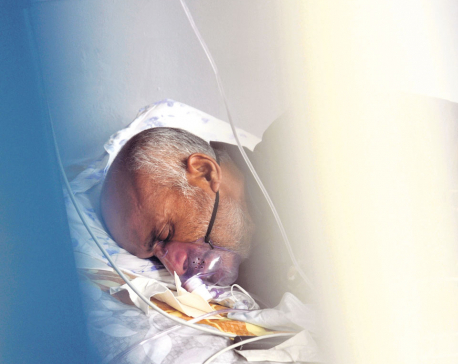 They tried to stanch a gun from Inspector Khem Nepal, who was hit with an iron rod in the neck by a protestor, leaving a deep cut,” Pokhrel said. Apart from Nepal, DSPs Kuldeep Chand and Dan Bahadur Malla were also injured. Inspector Nepal is currently undergoing treatment at Civil Hospital. The clash briefly obstructed a peaceful assembly being organized by independent supports of Dr KC on the other side of the road. Even though police claim that only four individuals were injured on the protestors' side, the NC in a statement maintained that over four dozen members of its youth wing sustained injures when police used force to disperse them. Among the injured are President of Nepal Tarun Dal, Jeet Jung Basnet and NC Lalitpur President Madan Amataya. Basnet was hit on the head with a police baton. The two are also undergoing treatment at Civil Hospital. After police used force, enraged protestors vandalized three government vehicles including the vehicles of provincial ministers parked alongside Indreni Food Land. Two of the vehicles belonged to provincial ministers of Provinces 3 and 4, Yuba Raj Dulal and Nar Devi Pun. They had reached Indreni Food Land to attend a function. Protestors also smashed windows at Indreni Food Land. Police chased the protestors to Bijuli Bazar area, firing tear gas canisters and using batons. 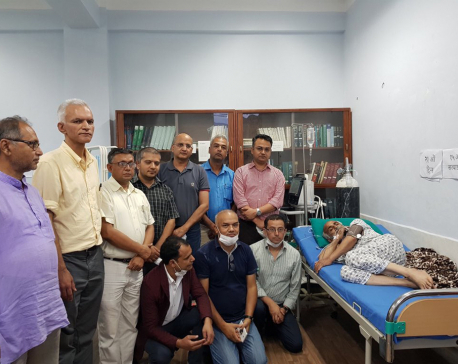 Following the clash, NC President Sher Bahadur Deuba and senior leader of the party Ram Chandra Poudel reached Civil Hospital to take stock of the injured party cadres, according to a press statement issued by the party. President Deuba strongly condemned the use of force by police against his party carders. He said the government will pay a price for using force against peaceful demonstrators. “The government's arbitrary use of force against peaceful demonstrators shows that it is on the way to becoming autocratic,” he tweeted. Later in the evening, Deuba reached the official residence of the prime minister at Baluwatar to hold talks with Prime Minister KP Sharma Oli. During the meeting, he warned the prime minister that his party would come up with more stringent protests if the government reacts violently against peaceful demonstrations. He also suggested to Prime Minister Oli to hold immediate talks with Dr KC and address his concerns.